Home > Blog > How Are PCBs Manufactured? PCBs are one of the most integral components of every electronic device, which is the main element that makes the electronic devices function. They connect all the other components within to help power and signals transfer from one point to another to help the device work. Although so important, they are not very big in size. With the tiny size that they come in, it is imaginable how extensive their manufacturing process may be! The first step in the PCB manufacturing process is designing the board. This is generally done with the help of a computer software. A trace width calculator is used to decide upon all the details required for all the inner and external layers. 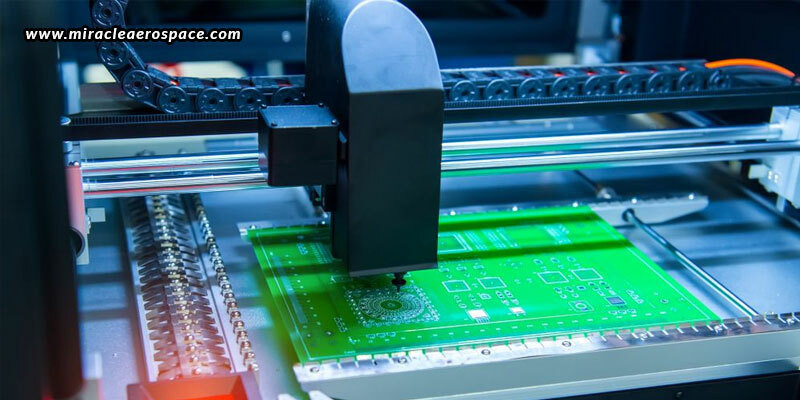 Once the design is finalized, a plotted printer is used to print the design of the PCB, which produces a film that shows the details and layers of the board. Two types of inks are used on the inside layer of the board – one is clear ink to show the non-conductive areas, and the other is black ink to show the conductive copper traces and circuits. In the case of outer layers, both the types of inks are used, but with the indications reversed. By passing the materials through an oven, the substrate, or insulating material of epoxy resin and glass fiber is formed, on which all the components will be held. Copper is pre-bonded to both the sides of the layer, and then etched away to show the design from the prints, as designed in step 2. Once the design is formed on the substrate, a photosensitive film made from photo-reactive chemicals covers the structure. Such covering will help align the blueprints and the actual print of the board. The resist and laminate now go under UV lights to harden the photoresist. The light reveals the path of the copper. The black ink areas prevent hardening in those regions, which can be removed later on. The board is then washed in an alkaline solution to remove any excess photoresist. Any unwanted copper that remained on the board is removed as the alkaline solution eats away at it. The hardened photoresist thus remains intact. Now, the board will be checked for any kind of errors, before moving ahead. All the drilling of the holes and alignment of the components will be checked. This step is important because after this, any kind of errors will not be able to be corrected. Multiple layers are now fused together, as required. Metal clamps hold the layers together as the lamination begins. An epoxy resin layer is at the base, followed by a layer of substrate over it, and then a copper foil layer, and more epoxy resin on top. Finally, there is more copper layer applied. Now the layers are pressed tightly together with the help of a mechanical press. Pins are punched through the layers to keep them properly aligned and secured. When high amount of heat and pressure is applied to the board, the epoxy resin melts and fuses the layers together. A computer guided drill is used to drill holes into the layers, so as to expose the substrate and inner panels, after which any remaining copper is removed. A chemical solution is now used to fuse all the layers together. Then, other chemicals are used to thoroughly clean the board. The chemical also coat the panel with a tin copper layer, with the copper seeping into the drilled holes. Similar to step 3, a photoresist layer is applied to the outer layer, onto which UV light is shows to harden the layer. Any excess photoresist is then removed. Again, step no. 11 is repeated on the outer layer too, wherein a thin copper layer is applied. Any excess copper is then removed. With all of this, the PCB’s connections are established. A solder mask is applied after cleaning the board thoroughly. An epoxy resin is also applied with the solder mask film. Any unwanted solder mask is then removed with UV light, and the required solder mask is baked onto the board. Here, all kind of critical information is printed onto the board, after which the PCB passes through one last coating and curing process. Lastly, the board is finished with a solderable finish to increase the quality and bond of the solder. Now, with the PCB been created, it is important that it is electrically tested before being packed and delivered to the customer. This confirms the PCB’s functions to be effective. Using the above mentioned basic steps and many more to provide the best finishes and functionality, Miracle Aerospace manufactures the best quality PCB assembly from India that promises consistent quality performance. So, get in touch for any kind of high-mix, low, medium, and high volume orders.